Silhouettes of New Brunswick women who have been killed by intimate partners are on display Thursday to mark the National Day of Remembrance and Action on Violence Against Women. Ceremonies are being held across the province and country Thursday to mark the anniversary of the 1989 Montreal Massacre, when a gunman shot 28 people and killed 14 women at a polytechnical school. Since that day, more than 50 New Brunswick women have been killed by their husbands or boyfriends, said Deborah Doherty, executive director of the Public Legal Education and Information Service of New Brunswick. "How can we make sense of these deaths? How can we learn something that might prevent future deaths?" asked Doherty, who is also a researcher for the Silent Witness Project, a campaign to remember victims and promote action to end violence against women. She has spent years talking to the families of victims, reading court documents and gathering information from the media to piece together the stories of women who were killed by their intimate partners. A group from Charlotte County originally spurred the effort to bring the Silent Witness Project to New Brunswick after seeing a display at a conference in Maine, she said. "You saw this sea of red. Some people likened it to blood red. It was so compelling, so poignant ... Anyone... just felt compelled to go over and read about the life of the woman," Doherty said. 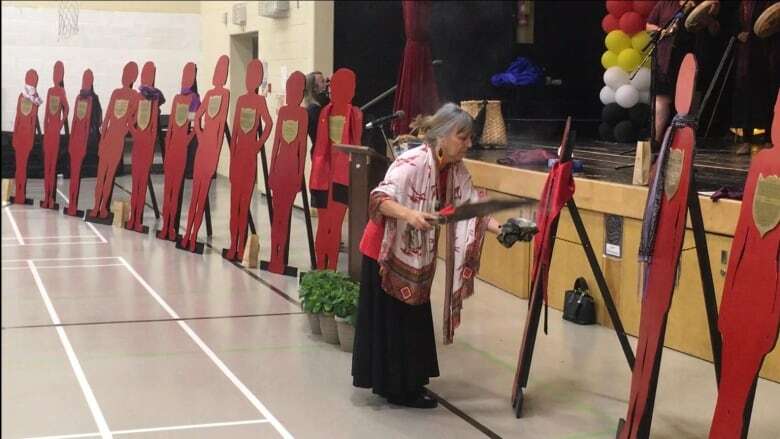 The New Brunswick Silent Witness Project now includes 32 life-sized wooden silhouettes. There's one for Sheila Bari, 26, of Fredericton, who was bludgeoned to death by her estranged husband in her apartment in 2003. Another represents Geraldine Theresa Paul of St. Mary's First Nation, who was beaten to death by her partner in 1981. Each silhouette is painted red and bears a plaque with a write-up about how the woman died, as well as how she lived. "You know, she was renowned for her homemade pickles, she loved jazz. ... Personal things you never think of when you think of someone who's a victim," said Doherty. Requests for silhouettes can come from a community organization, friends or family, sometimes many years after their loved one's death. "There was one family, the son said, 'I'm very honoured that you're doing a silhouette for my mother. I can't come to the ceremony or be involved because it's too painful," she said. Doherty said it took a few years before the son eventually attended one of the ceremonies and saw his mother's silhouette. He hugged and thanked her for the tribute. One of the Silent Witness silhouettes is for Rowena Sharpe, who was killed by her husband in 2012 before he killed himself. That is something she has in common with 13 other women out of the 17 who were killed in domestic homicides in the province between 2010 and 2015. From 2001-2011, New Brunswick had the highest murder-suicide rate among the Canadian provinces. Police typically say little about these cases, other than that two people have died, and there's no need for the community at large to be afraid for their safety. Doherty said the lack of information poses challenges when trying to tell a woman's story. "It's not a curiosity that people want to know. It's public policy. We want to know because that should never happen to another woman...What were the factors?...Was it a firearm or something else? "It's for the purpose of trying to make lives safer." Doherty wondered what the reaction would be if as many people died in accidents on the same highway. "This is an epidemic. You're just not seeing the crash," she said. "But if we bring them all together, the silhouettes, and we say, 'Look, something has to be done to that rocky road that's killing people. How do we fix it?'" Some of the silhouettes will be on display Thursday evening from 6:30 to 8:30 p.m. at the New Brunswick Community College in Saint Andrews. 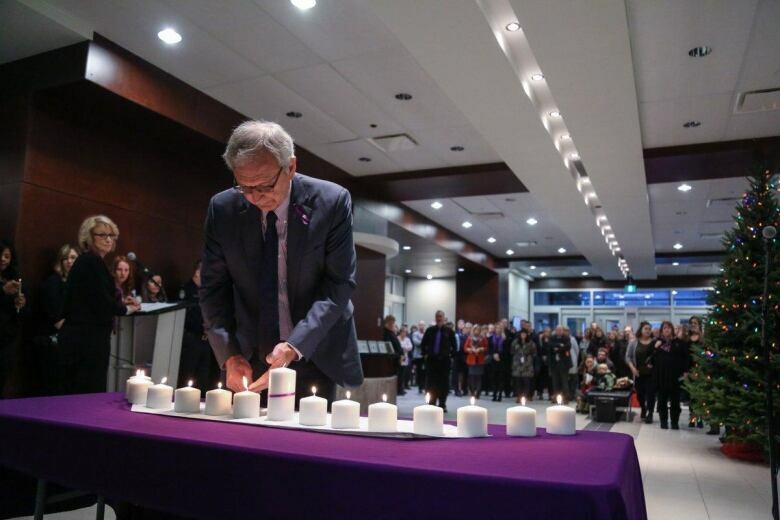 There is also a ceremony to mark the National Day of Remembrance and Action on Violence Against Women on Thursday evening in Riverview at 6:30 p.m at the Father Dan Bohan Family Centre. Donations of cash and/or feminine hygiene products will be collected at the door for a shelter in Sainte-Anne-de-Kent. 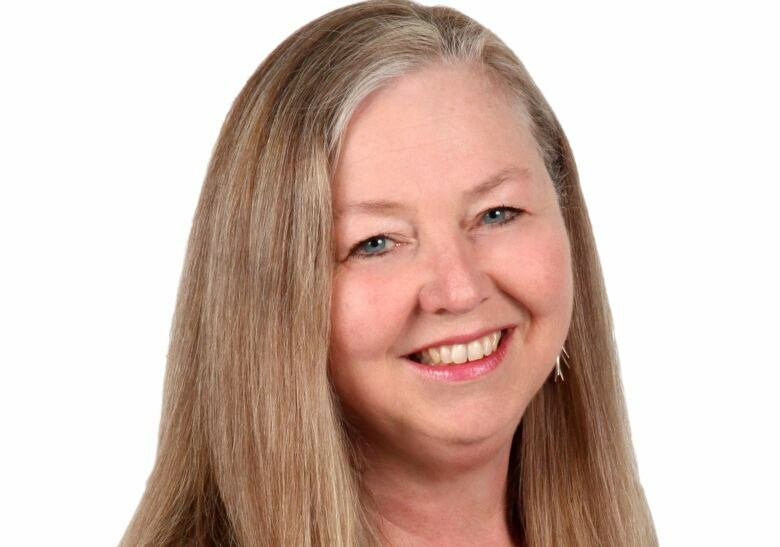 A ceremony at Mount Allison University in Sackville begins at 5:30 p.m. Thursday in the Library/Crabtree breezeway, and there is also a ceremony in Saint John from 6 to 7 p.m. at the New Brunswick Museum's Mary Oland Theatre.